Use a large sharp knife to carefully cut the top and bottom of the watermelon to create flat surfaces. Stand the watermelon up vertically and cut off the white and green parts. 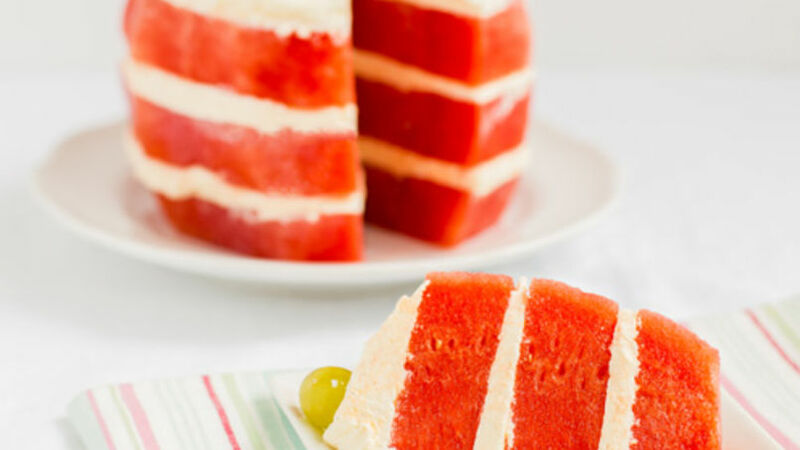 Then cut the watermelon into 3 equal layers. Set aside. Whip the cream at high speed using a hand mixer until it thickens. Add the sugar and vanilla. Keep whipping until the mixture thickens and creates firm peaks, about 5 minutes. Transfer a layer of watermelon on to a dish. Use paper towels to eliminate as much of the moisture as possible. Spread a generous amount of cream on to the surface. Repeat this process until you've used all the layers. Refrigerate for 30 minutes before serving. Decorate with grapes, cut into slices and serve immediately. The first time I saw this dessert I was a little confused. I couldn't imagine what the combination of watermelon and whipped cream would be like, but I must admit that it was delicious and refreshing. I invite you to try it out and take advantage of the sales on seasonal fruit. Enjoy!